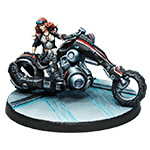 Do you want to buy a miniature just to be able to show off your painting skills? Do you want something different? Discover our line of Bootleg miniatures, or our Aristeia! skins - metal miniatures ideal for painting.